This story was updated at 7:53 a.m. ET. A Russian Soyuz spacecraft is poised to launch toward theInternational Space Station Tuesday to deliver three new members of the orbitinglaboratory's multi-cultural crew. The Soyuz TMA-19 spacecraft is set to lift off at 5:35 p.m.EDT (2135 GMT) from Baikonur Cosmodrome, Kazakhstan in Central Asia carryingtwo American astronauts and one veteran Russian cosmonaut toward the thespace station. "The station has grown magnificently. You can'tbelieve it," said cosmonaut Fyodor Yurchikhin, who is returning to thespace station on the Soyuz for the first time since 2007, in a prelaunch pressconference. Yurchikhin will launch alongside NASA astronauts DouglasWheelock and Shannon Walker to join three other crewmates already aboard theInternational Space Station for the joint Expedition 24 mission at the nearlycomplete orbiting lab. It will actually be 3:35 a.m. local time on June 16 whenYurchikhin and his crewmates blast off, placing their liftoff on the 47thanniversary of the launch of the first woman in space ? cosmonaut ValentinaTereshkova ? in 1963. "It's an honor to launch on her date, as well,"Walker said. Over the next six months, the astronauts and cosmonautexpect to perform several spacewalks to maintain the $100 billion spacestation. They also expect to host NASA's two finalspace shuttle missions ? currently scheduled for mid-September and lateNovember ? before the U.S. space agency retires the shuttles for good. "It's a big change in our program?but change is notalways bad," Wheelock told reporters. And while the new station astronauts may be present for the endof space shuttle era, their mission to prime the outpost for anotherdecade in orbit is also exciting, he added. "It's actually bittersweet to see the shuttle go butit's really an exciting time as well," Wheelock said. "We're alsogoing to be the first increment to really go to full utilization of the space stationas an orbiting laboratory." Once the space shuttles retire, NASA will rely on RussianSoyuz vehicles to ferry American astronauts to and from the space stationuntil new commercial spacecraft are available under a new space plan announcedthis year by U.S. President Barack Obama. Yurchikhin, 51, is a veteran cosmonaut with Russia'sFederal Space Agency making his third trip to the space station. He commandedthe orbiting laboratory for six months in 2007 during the Expedition 17mission and flew on NASA's STS-112 shuttle flight to the station in 2002. For this mission, he is commanding the Soyuz treks to and from theorbiting laboratory. "It should be very great Expedition, I hope, likeany Expedition on space station," Yurchikhin said in a NASA interview. Yurchikhin is a mechanical engineer with a Ph.D. ineconomics who joined the Russian Space Corporation (RSC) Energia's cosmonautcorps in 1997 following a series of flight controller and engineering jobs. Heserved as the lead engineer for the joint Shuttle-Mir space station andNASA-Mir programs, ultimately flying on the shuttle Atlantis in 2002 before hisfirst space station flight. He and wife Larisa have two daughters. Yurchikhin is fromBatumi in the Autonomous Republic of Ajara in Georgia. ?Like Yurchikhin, Wheelock ? who goes by the call sign"Wheels" ? is making a return to the International Space Station. A colonel in the U.S. Army, Wheelock last flew to thespace station during a 15-day mission aboard the shuttle Discovery in late2007. This flight, however, he is ready for the long haul and has been postingupdates and photos from his mission on Twitter under the name Astro_Wheels. "Our chariot awaits!The Soyuz TMA-19 rocket standing ready at the launch pad," he wrote onSunday after the rocket was hoisted into launch position. Wheels isexpecting to pull double-duty aboard the space station, first as a flightengineer with the Expedition24 crew and later in command of the station's Expedition 25 mission inabout three months. He has been working hard to hone his leadership skills. "So that?s my primary task, and I?m very muchlooking forward to flying aboard this marvelous machine," Wheelock said ina NASA interview. Wheelock, 50, is from Windsor, New York and is veterantest pilot and spacewalker who joined NASA's astronaut corps in 1998. This ishis second space mission. Walker, 45, is the only rookie on this Soyuz launch, butshe's no stranger to human spaceflight. She was born and raised in Houston ? the Texas-home toNASA's space station and space shuttle mission control centers ? and is thefirst-ever Houstonnative astronaut to earn her spaceflight wings as a professional NASAspaceflyer. Walker joined NASA's ranks in 1987 as a space shuttleflight engineer after earning a doctorate in physics from Rice University. Shewas accepted to the astronaut corps in 2004 and spent much of her time sincelearning how to help fly Russia's Soyuz spacecraft. "Only a handful of us have been trained as theco-pilots on the Soyuz, and it?s quite an extensive training process. I?vespent the better part of the last three years over in Russia working with myRussian colleagues and my Russian instructors to learn how to be the co-pilot,"Walker said in a NASA interview. "So it?s quite an endeavor." And Walker is not the only member of her family to fly inspace. Her husband is Andrew Thomas, a veteran NASA astronaut who has flownthree short-duration missions on space shuttles and one months-long trip toRussia's Mir space station. Yurchikhin, Wheelock and Walker are launching to thestation during a busy time for the orbiting lab. Earlier this month, June 2, the station's formerExpedition 23 crew returned to Earth in a picture-perfect landing on thesteppes of Kazakhstan. Since then, the station's crew size has been athalf-strength. But that will change Thursday evening when the SoyuzTMA-19 docks at the station and its three-person crew joins the current Expedition24 mission team commanded by Alexander Skvortsov of Russia, with cosmonautMikhail Kornienko and American astronaut Tracy Caldwell Dyson as flight engineers. An unmanned Russian cargo ship is also slated to launchtoward the space station later this month. 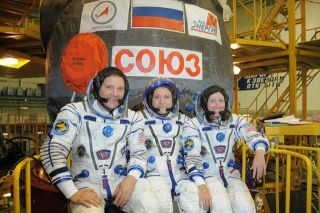 SPACE.com will provide complete coverage ofthe Expedition 24 crew's mission to the International Space Station. Click here for mission updates and launchupdates.